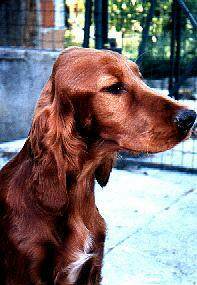 This page is featuring some of the Irish Setters we have bred and are very proud of. All these dogs come from just 3 litters bred in 1994, 1997 and 2000. They have done really well for their new owners and we want to thank them for all the hard work and love they have given our "babies". Lux J Ch Red River Ankaranski (1994-1996), owned by Willy Duynekerke (v.d. Westerhuy) and Yvonne Hill-Decoster (Vicary's) was No. 3 Irish Setter Dog in Holland before his untimely death. River sired some lovely puppies f.e. Tara Gentilitly v.d. Westerhuy, Trevor Good Gracious v.d. Westerhuy, Hope v.d. Burg, Esmeralda v. Shans Tot Wildban etc. He is very much missed and remains always in our hearts. 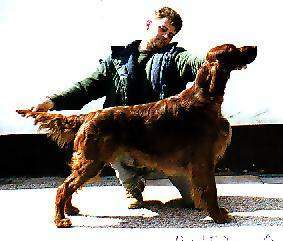 Slo Ch Red Ruby Ankaranska owned by Mrs Tatjana Klinar was Top Irish Setter In Slovenia for 1996. She won R.CAC at the World Show in 1996 and CAC at the Eurodog in 1999 and was Croatian Club Champion in 1996. Ruby is also a Group Winner and produced two excellent litters for her owner. Only shown once in 2000 (excellent at the World Show in Milan) she will be campaigned for her Int. Ch. title in 2001 so watch out. Slo Ch Talitha Ankaranska (BIS, Multi Ch Scandal v.d. Westerhuy ex Multi Ch Vicary's Pumpkin) is also owned by Mrs Tatjana Klinar. Tally won a group at 16 months old and was Best Junior In Show winner. Tally became Slovene Champion in 2000 and won 2nd prize at an International Autumn Pointing & Retrieving trial. She also does well in Obedience Trials. In 2001 Tally won 1st prize in special Water Trial for all breeds. Tally will have a litter end of 2001. She has been mated to Bony izpod Belšce. The litter is linebred on our Ch Vicary's Pumpkin. VDH Ch Tiffany Ankaranska pictured here at 4 years old. She is owned by Thomas Hövener ("Yesterday's Hero") and Alenka Pokorn ("M'Eudail") and lives in Germany. She has become German VDH Champion in April 2001. Hopefully "Fifi" will have a litter early in 2002. Thumbelina Ankaranska is pictured here at 5 months old. She is owned by Mr and Mrs Bernd Kleine in Germany, kennel "v. Füllenfeld". Not shown much she managed to win Junior Class at the Irish Setter Club of Germany show in 1998. She produced 2 litters by Xam Marlow of the Hunter's Home (Tarodene Thaddeus ex Living Highland Forget-Me-Not) in 1999 and 2001. Zmely Ankaranska is owned by Silvia and Randy Lehner in Austria. She is Best Junior winner in Slowakia and was placed 2nd in Junior class at the Graz International in March. She has also passed her Junior FT. Very energetic young lady with a strong will of her own she will take a lot of work, but we feel she is headed for big things. Pictured here at 15 months old. Melly won her first CAC at the Oberwart International in July. Our beautiful Zafir Ankaranski already travelled to the other side of the World to start his new life with his owner Mr Samson Go and his family in the Phillipines. Lovely boy with super character will certainly make waves wherever he goes. We wish him all the best and miss him very much. Zafir already won his first BOB, but needs to mature more and will start serious show career in 2002. Zipp Ankaranski is owned by Kati Piippo in Finland. He has been shown at the Helsinki International and was 2nd Best Puppy. Now he is taking time out to grow and will be back in the ring next year. Most beautiful boy with personality to match. He was our "pick of the litter", so we are sure he is headed for a bright future. Zaggy Ankaranska is owned by Giulianno Gambato in Italy and has started well with her show carreer at the Vrtojba International with Best Junior win and R.BOB. She has also taken Best Junior at the Ljubljana International. Small girl with lovely face and lots of energy. We look forward to her future successes. Her last success is winning R.CACIB at Trieste International in October 2001. Hr J Ch Zennith Ankaranska owned by Alenka Pokorn and Urška Tavčar was Best Junior at both Croatian and Austrian Club Show this year. She has won Best Junior In Show at the CAC Pinzenau in Germany. In October she won her first CAC's in Slovenia and Croatia. She is also FT qualified. Slo J Ch Zack Ankaranski is owned by Mr Franc Kelher and is roommate of our very promising Cocker Ziggy Ankaranski. Zack stil needs to do a lot of growing up, but his first show outings are prooving his quality. Zack will be out with us during next few years campaining alongside Zana and is already FT qualified.